Most folks believe that cork is a new trendy material brought on by green building when in reality it has been used for flooring for over a century. 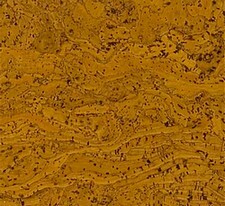 Cork flooring is a very versatile material. When used for flooring, it presents a tough resilient surface for use in many rooms. Cork blends in with most decor and furniture and comes in a wide range of colors. It is also water resistant and comfortable underfoot; making it an interesting choice for kitchen and bathroom floors. It also has excellent acoustical properties as it absorbs sounds which make it a perfect choice for media and music rooms. In addition to the acoustical properties, cork also affords thermal insulation properties. One fact that most folks don't know is that cork floor tiles or planks may be refinished. Depending upon what type of finish it has (wax or polyurethane), the maintenance will vary. Cork is also very resilient and is highly abrasion resistant and therefore is one of the easiest flooring materials to maintain. More than hardwoods, cork is a very renewable resource coming from the outer bark of the Quercus suber tree. The bark is stripped off the tree without harming it and the tree regenerates its outer bark in a 9 year period. The downside is that it is impressionable. Heavy furniture will leave indentations so furniture pads should be used to avoid this problem. And although it does come in a variety of colors, they are much more limited than that of other flooring types. If you are trying to keep costs down, cork is a great choice. Not only is it about one half the cost of natural hardwoods, but cork is also one of the easiest materials to install yourself. Cork is generally available in 12" x 12" or 12" x 24" and can be bought in both pre-finished and un-finished floating planks or glue-down tiles. There are few things to take into consideration before you start though. We have listed several of the more important ones here. As with all flooring materials, you should always follow the manufacturer's recommendations for installation.